I was waiting for that sole bench marker that will change the way we dine here in Cebu. Honestly, who among you asked for specialty places that serve only 1 food item? We have seen it from movies and documentaries alike. 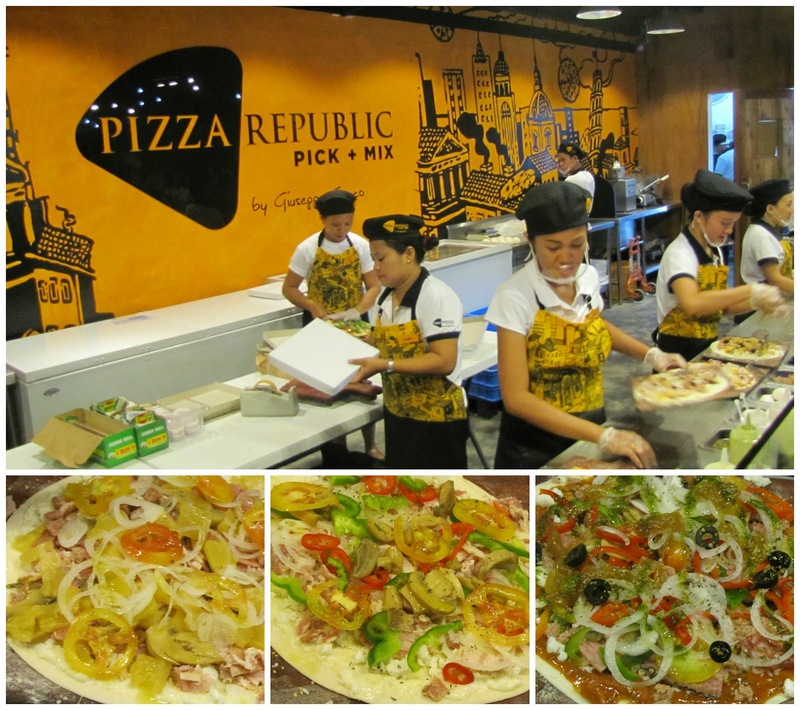 And as the cherubs open the heavens, Pizza Republic fell and was welcomed right into every Cebuano's hearts. One thin crust at a time. Key word here is customize! DIY pizza for the frustrated ones who can't seem to get it right and certainly a great fit for anyone who is up for anything new. Yes, you can go crazy with bacon or have an all cheese pizza topped with black olives. Absolutely no regrets and shame. Certainly, no 2 pizza is alike. Select from your heart's desires: starting from the base sauce, type of cheese and your meat preference! With great power comes great responsibility. So select your toppings wisely else you have wasted a perfectly almost edible meal. If you are too scared to dive into the crazy pizza creation world, fret not as they have a short menu of pizza combo available for you to try. The place is spacious and they have high wooden chairs and comfy couches out back for guests. Certainly not the type of place you can stay longer to chat with friends but a good place to come back every now and then. The assembly line starts with the dough. Freshly made and baked daily. Select your based sauce and then go over the available toppings. Efficient and certainly accommodating staff will take care of everything as you wish. Yes, you can add more cheese if you like. 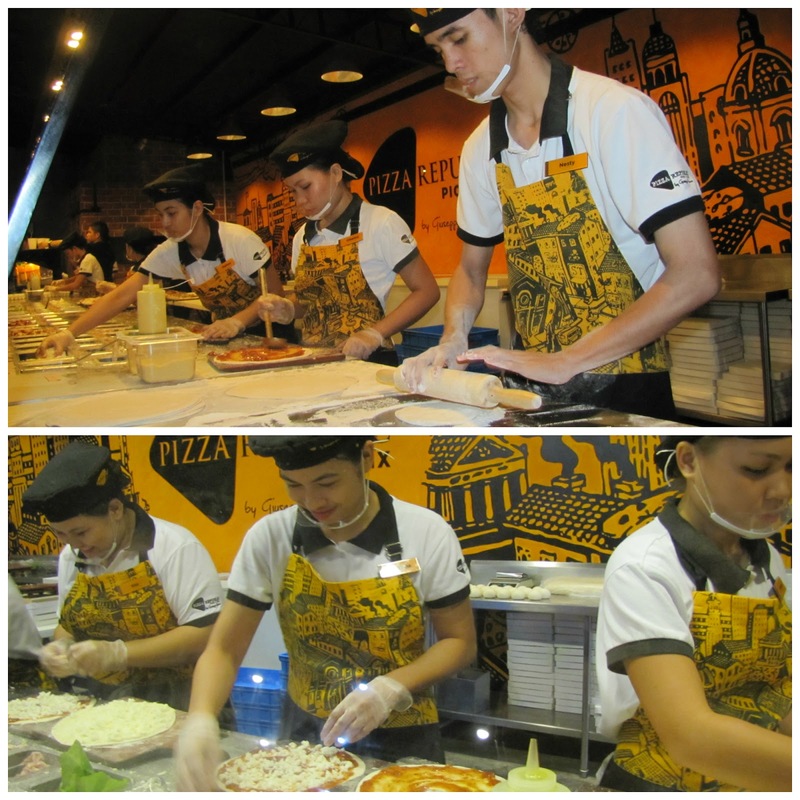 Avoid the long queues by coming early for an early dinner around 4-6PM. An onslaught of people check in at 7PM onward. Don't get overwhelmed with all the toppings. People get overexcited that they think they needed more toppings than usual. Pizza crust is thin so cooking time is really short. 10-15 minute wait time. This is during off-peak hours. Keep it simple. Enjoy the crust and savor the pizza. Opt out of the oil toppings at the end of the assembly line. You have full control of what goes in on your pizza. If your pizza sucked, you can visit and try again. A good reason to come back yes? Wa gihapon ko naka suway sa Pizza Republic haha Taas gihapon ang linya, huh? Wala gihapon nawala ang line. Mao mas better adto kag mga 4-5pm kay mingaw pa.